Adjusts from 35 to 60 degrees to accommodate roof pitches of 6/12 to 14/12. Removable insert allows for use of 7" or 9" plank. 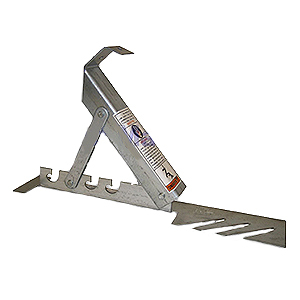 AJC roof brackets feature heavy duty all steel construction and are riveted for extra strength. Rivets are recessed to prevent marring of shingles. Designed for easy installation and removal.